Master P is out with the video to his new single ‘Get The Party Crackin”, featuring Silkk, Halleluyah, Rugar, off the New Orleans rapper’s album ‘Ghetto Bill’, out June 21st on The New No Limit/Koch. Watch it via YouTube below. Rappers on television this week include Romeo and Master P, who visit ‘106 & Park’ on Tuesday and Missy Elliott, who visits ‘Total Request Live’ and ‘The View’ on Wednesday. The American Basketball Association (ABA) Long Beach Jam franchise has signed point guard Percy Miller, better known as Master P, President Steve Chase announced on October 8th. “In addition to Master P’s musical talents and widespread popularity, he brings considerable floor general skills to our team,” Chase said. 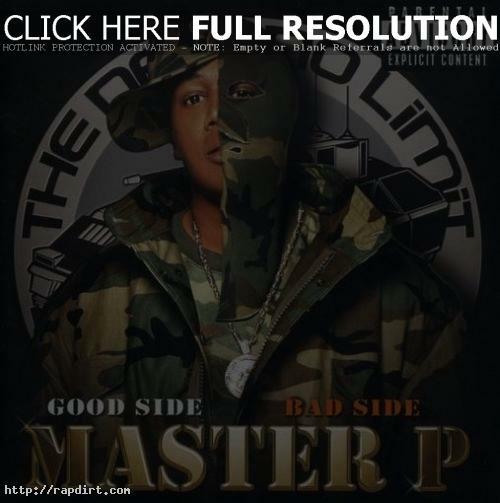 MSN is streaming Master P’s full CD ‘Good Side Bad Side’. Listen to the album at last.fm. Rap acts on television this week include Kanye West, who drops his brand new video off at ‘Total Request Live’ on Monday; Master P, who appears on ‘106 and Park’ on Monday; Queen Latifah, who appears on ‘The View’ on Tuesday; Damon Dash, who appears on ‘The View’ on Wednesday; Nelly, who phones into ‘TRL’ on Wednesday to premiere his new video; Nas and Lloyd Banks, who appear on ‘106 and Park’ on Thursday; and Ozomatli, who perform on ‘Late Night with Conan O’Brien’ on Friday. Spread the word….the Music Industry is about to change drastically! It seems to me that you’re on a quest to become the next Nelly. The only question I have for you is why? Why are you copying other hip hop artist’s style to re-invent yourself? Why aren’t you proud of your own accomplishments and originality? I’m not writing this to bring you down, but lately I’ve been questioning your marketing decisions. Did you not know that Nelly was using the term ‘We All We Got’ for his Derrty Entertainment slogan? I’m sure they started saying it AT EVERY OPPORTUNITY at least 6 months prior to you printing it on t-shirts. Now you’ve not only decided to come out with a female line of jeans that look like cheap Applebottom imitations, but you’ve got the audacity to re-invent his original ad! This is all aside from the jacking of Ginuwine’s ‘In Those Jeans’ concept for your own jeans song and it’s uncanny resemblence to Usher’s hit single ‘Yeah’. What’s next? An appearance on MTV’s ‘I Want A Famous Face’? Or in your case, a different famous face? Bottom line, I used to be a huge No Limit fan and it’s pretty sad to see it come to this. There are more instances that come to mind in regards to you copying other artists and I wish you’d stop. I miss the old Master P that blazed his own trail. The one that had people imitating HIM. The intelligent businessman that made me proud of the direction of hip hop. Where is that guy? Choppa, formerly of No Limit/Take Fo Records, has recently left Master P’s No Limit Records and signed to Roy Jones Jr.’s label Body Head Entertainment. Choppa has signed into a 5-album deal with his first release planned for an April 2004 release. The full article at ballerstatus.net has since been removed or relocated. Rap acts on television this week include David Banner, who performs on ‘Last Call with Caron Daly’ on Monday; Baby Bash, who performs on ‘The Ellen DeGeneres Show’ with Frankie J.; Ice Cube, who appears on ‘106 and Park’ and ‘The Late Late Show with Craig Kilborn’ on Tuesday, and ‘Last Call’ on Wednesday; Juvenile, who appears on ‘106 and Park’ on Wednesday; Master P, who appears on ‘106 and Park’ on Thursday; and Chingy, who appears with FF on ‘106 and Park’ on Friday.